Hand dryers are electric devices installed in public restrooms, washrooms or any environment that has the need for hands to be dried. Hand dryers are becoming very popular with many industries because of their simple convenience and economic advantages. Installing a hand drying unit in your establishment can cut hand drying expenses by as much as 95%. No longer do you have to buy paper towels. Hand dryers require very little maintenance compared to paper towels, which must be constantly refilled. An additional expenditure is the removal of paper waste, which requires time and effort. Due to the reduction in litter and waste in comparison to paper towels, hand dryers are much better for the environment. These factors alone should make buying a hand dryer for your establishment an obvious choice. High-Speed Hand Dryers are rapidly becoming a popular choice in many public restrooms. 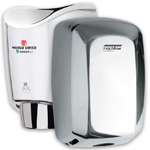 They offer many great advantages which make them an excellent choice for your hand dryers needs. The first obvious advantage to the high-speed hand dryer is that it dries your hands fast. Many of today's most popular high-speed hand dryers can get your hands completely dry and just a matter of seconds. Another really popular advantage to drying your hands that high-speed is the experience. Research has shown that users thoroughly enjoy the thrill and the sensation that they get the high-speed air rapidly drying and warming their hands. The third advantage to the high-speed hand dryers is that they are an excellent economical choice. All hand dryers are great for the environment compared to the use of paper towels, but high-speed hand dryers are much better. Not only high-speed dryers use for a shorter period of time, but very often they have a much lower wattage rate. Hand dryers that use less power save both the owner money and help the environment. 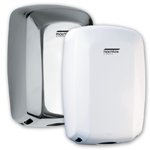 Variable speed hand dryers allow you to set the speed of the airflow of your hand dryer to your desired rate. This control option can allow for many great advantages. The first thing that is great about being able to choose your speed is noise level. The lower the speed, the less noise the hand dryer will produce. Depending on the environment that you're placing your hand dryer in, the amount of noise that it produces can be a factor. Let's say you're installing your hand dryer in a low traffic restroom and it doesn't matter if it makes a lot of noise, you may feel free to turn the airflow speed to high. But, let's say your hand dryer is installed in a busy kitchen. Due to the high traffic and noise of everything else in the kitchen, the added noise of a hand dryer running could be a detriment to the staff's communication. In this situation could turn the airflow to the slowest setting, reducing the extra noise that the hand dryer would produce. Another wonderful example of the advantage of a variable speed hand dryer is power consumption. Due to the fact that variable speed hand dryers can be set to the desired level, they can be very efficient at conserving energy consumption. Low-energy consumption can be a wonderful benefit for both the owner and our environment. Energy efficient hand dryers can be great for both the environment and your checkbook. Also known as high efficiency hand dryers, these units can often reduce hand drying costs by up to 95% compared to paper towel dispensers. This advantage along make energy efficient hand dryers the obvious choice for many businesses and individuals. With drying times of only a few seconds, the next generation green hand dryers are three times faster than your standard conventional hand dryers, and consistently use much less electricity. By choosing eco-friendly hand dryer you can improve your eligibility for LEED credits, while at the same time achieving huge cost savings and greatly reducing your energy consumption. Energy efficient hand dryers operate with superior performance, lower maintenance cost and less resource usage than say traditional hand drying solutions, which make them an excellent choice for any public restroom, our environment that needs and dryer. 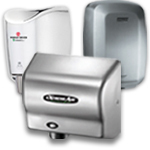 Energy efficient high speed hand dryers are manufacturer by two of the best companies in the business today. The American Dryer eXtremeAir EXT and the World Dryer Smartdri are both energy efficient high speed hand dryers that will dry hands fast while using a fraction of the energy. These two features gives you a satisfied visitor for less cost. Saniflow Corporation has probably the most versatile hand dryer on the market today. The Saniflow Speed Flow hand dryer is surface mounted and ADA compliant without having to use a recess kit and is a fast hand dryer. It accepts any voltage without having to buy a specific model and allow the owner to control the speed with a variable speed adjustment. In other words, there are germs and/or bacteria left on your hands after washing with soap and water. Drying yours hands with paper towel or electric hand dryers remove even more from your hands, actually making them cleaner.